I was on my way to the doctor when I came across this upstart plant. 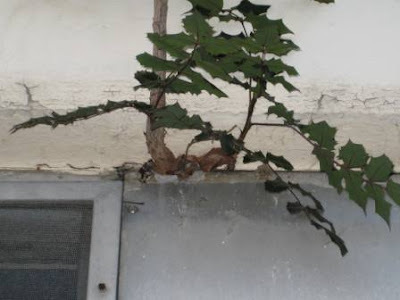 It had the nerve to grow out of the side of a building! 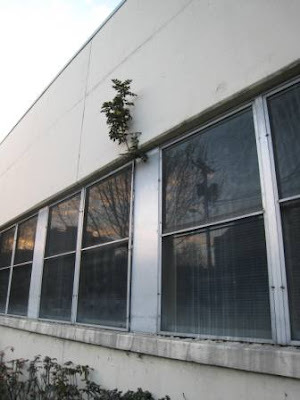 I thought perhaps it had grown from the ground up behind the metal panel between the two windows, emerging mid-building. A closer look revealed that it hadn’t come from the ground at all, but had taken root halfway up the building. Whenever I find something like this, it reminds me how temporary our buildings are, without a human to maintain them. 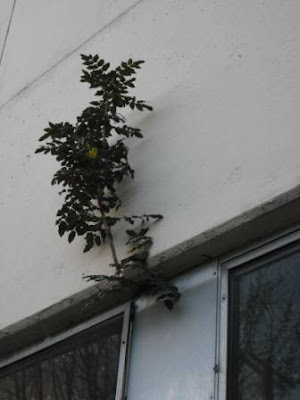 Plants, water, wind and weather are much stronger than concrete, given enough time. Lint Progress: Consignment store names. It’s like the owners think cute or punny names are fun. To me though, they are just irritating. Even my favorite consignment stores are guilty of this. It sounds like a more innocuous version of Mr. Pinky’s Hefty Hideaway. Posted on February 27, 2008 February 6, 2016 Categories All (-ish), To Occupy my TimeTags lint5 Comments on Lint Progress: Consignment store names. I really liked this book. It is small, so you can take it with you when you shop. The author explains what she, as a stylist does. Aside from dressing movie starts and personal clients, she also is hired by advertising agencies to dress any model you may see in the ad. This is a niche market I never even thought about. There were some good tips in the book. My favorite was to take your waist measurement and your rise measurement. When looking for pants, bring along a tape measure and use it to decide if you want to try on a pair of pants. The front of the pants should be half your waist measurement. If the rise matches, you have a potential winner. If not, move up or down a size. Genius! She also solved the mystery of taking measurements. I’ve often wondered how tight to pull the tape. I learned for comfortable ease, always add the width of two fingers into your measurements. Rita Williams’ mother died when she was four and after that she was raised by her Aunt Daisy. The book explores their contentious relationship, growing up Black in the middle of lily-white Colorado, their self-sufficiency and their extreme poverty. It was a very sad, yet fascinating story. I would love to find out what happened to Rita Williams after she left her Aunt’s care. I had some time to kill before watching the Oscars, so I made my way back to the Goodwill on 10th. I tried on a lot of pants and found a pair that fit–black even–but I didn’t really like them. I realized that if I bought the pants, I would just be perpetuating the dislike of my closet. So I put them back. Having more time to kill, I tried on skirts. Nothing really worked there either. Then I moved on to dresses. I’ve always loved dresses, much more so than skirts. I like that you just put on a dress and you are done. 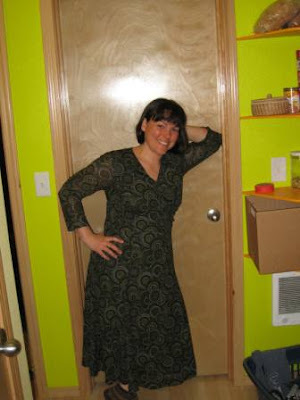 Of course, the mix and match abilities are more limited than with a skirt or pants, but dresses are more fun for me. I found two excellent additions to my wardrobe. This is an excellent dress. It can crossover seasons and can be dressed up or down. 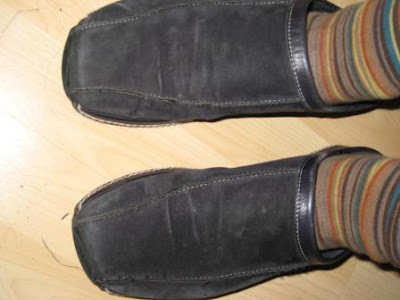 Though probably I shouldn’t appear in public in stripy socks and slippers. 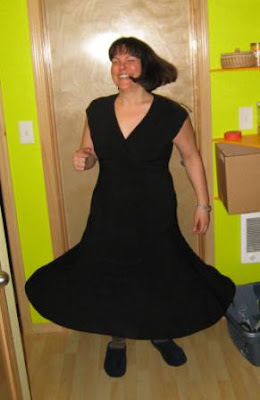 It also, as the picture indicates, has excellent twirl factor, something I’m always looking for in a dress. The material is thick and luxurious feeling. When I bought it, it was a bit too big at the sides, so I had it taken in and it fits perfectly now. I’m very excited about this dress. This is also a fabulous dress. It’s got a very nice wrap front and two layers of fabric which makes for a nice skimming effect the style books are always talking about. It’s a little fancy for where I work, but I can wear it to things like winter weddings, (which I bought it for) holidays and parties. I also found some shoes. They were barley used and much more comfortable than the shoes I was wearing. I snapped them up. It was a good shopping trip. Today was part two of shopping in my closet. After removing all the things I don’t love and am not wearing, I was to try on all my clothing and find great new combinations, making note of them on the handy form I cribbed from “Ready to Wear.” Then I could make a list of what I needed to take with me while shopping. It didn’t go as planned. I was very tired from my weekend in general, but had made it a goal to get this step done. I started with my long black skirt. I paired it with every top and top/jacket combo and made note of what worked. And that was all I could take. I know I should do the mix and match things, but it’s not going to happen. I basically know what I need: about three more pair of pants, all new tops, new dress shoes, new lace-up shoes, new bras, new underwear, new socks. We’ll just go from there. I got in a nice walk this morning and here are a few things I found. One of the things I’m going to do this year is build supports for my garden. 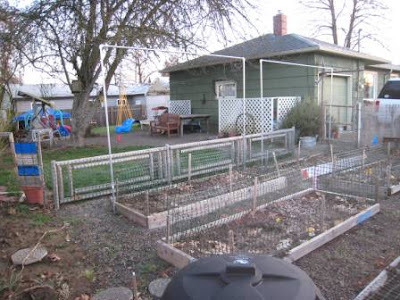 Square Foot Gardening says to use electrical conduit. It is the strongest for the cheapest. He specifically recommends NOT using PVC pipe. Apparently, it’s too flimsy. Electrical conduit is what you see here, but what they did, intrigued me. 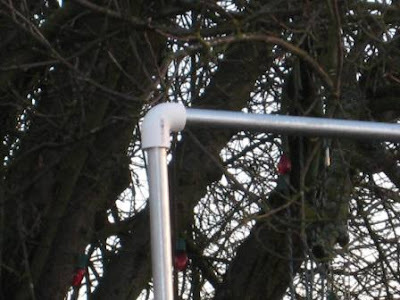 They have used a PVC pipe elbow to connect the two pieces of electrical conduit. I may just copy them. The Electrical conduit costs $1.97 for 10 foot lengths. The elbow connectors for the electrical conduit cost $4.95. I think I will try a PVC elbow first and see how it goes. 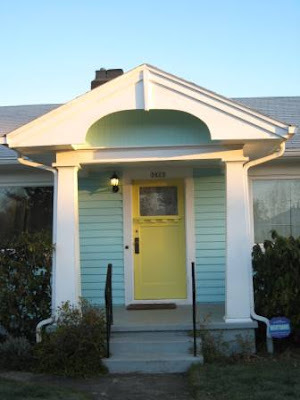 I love the blue house with the yellow door and the white trim. But you know what pulls it all together? The panel of fabric covering the window. Lovely, isn’t it? 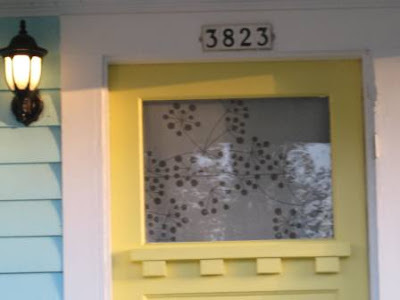 A very nice contemporary retro touch that fits right in with the house. I still had time to kill after “Seams to Fit” so I wandered up 23rd Ave. for some window shopping. On my way I came across another consignment store called “What’s Upstairs.” It’s located at 736 NW 23rd Ave. I climbed up the stairs to find out what was there. It was a store I didn’t like at all. The person working there was not really very friendly. Though I realize that the person could be unfriendly for a lot of reasons that have nothing to do with me, the first thing I think is that I shouldn’t be shopping there. So that was the first strike against them. As stated before, I don’t really like to shop. This means that I like things to be divided by size, so I can avoid looking through the smaller sizes. This shop was divided not by size, but by color. All the black pants were together, and all the black shirts, black sweaters, black jackets. On another wall were all the white things. In another room were all the colored things. All sizes, mixed up together. It was my shopping nightmare. Clearly, some people like this store. Someone on Citysearch would “move to PDX FOR THIS SHOP.” I’m glad she’s happy. I won’t be going back. After a doctor appointment, I stopped by “Seams to Fit” to see if anything fit me. The store is located at 2264 NW Raleigh and, according to it’s website, “offers an upscale retail environment for consignment of your quality articles.” It is a very nice environment and the clothing was very high quality. It was also very expensive. I’m not really an Armani-suit wearing person, but if I were, I would shop here. I had a lot of time to kill, so I tried a lot of things on. Including super fancy clothing that I had no intention of buying, even if it did fit. Clothing that costs over $40.00 makes me a bit nervous to wear. Some of the dresses I was trying on were $80.00 to $100.00. Used. Nothing, sadly, fit. I’m being very picky about fit and nothing fit the bill. Still, I left in good spirits. This won’t be a main clothing store for me, but I’ll probably stop in once in awhile. One day, Mia Fontaine, the seemingly normal 14 year old daughter of Claire Fontaine, just up and ran away. When Claire found her, she was using drugs. This book, written by both mother and daughter, follows their story as Claire works to get Mia into a treatment program she can’t run away from. It was very gripping for the majority of the book, though the time Mia spent in treatment did drag on a bit. It was interesting to see how Mia’s drug use changed her mother and herself, for good.